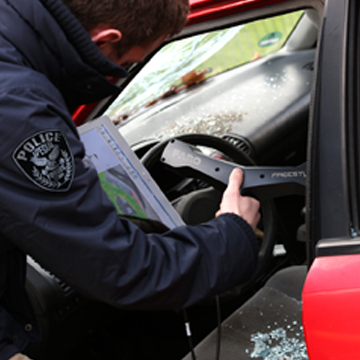 FARO Technologies, the world’s most trusted source for 3-D measurement, imaging, and realization technology, is just out with its new Freestyle3D Handheld Laser Scanner, a revolutionary scanning device that helps law enforcement capture and share information faster and easier. 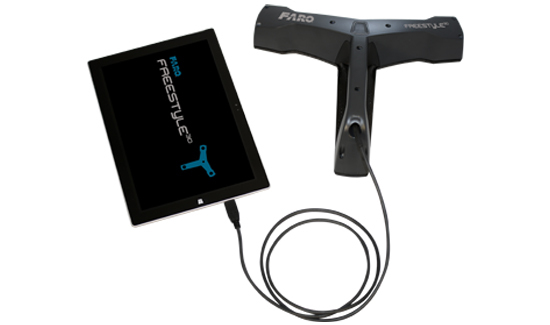 The FARO Freestyle3D is equipped with a Microsoft Surface™ tablet and offers unprecedented real-time visualization by allowing the user to view point cloud data as it is captured. The Freestyle3D scans to a distance of up to three (3) meters and captures up to 88K points per second with accuracy better than 1.5mm. The patent-pending, self-compensating optical system also allows users to start scanning immediately with no warm up time required. The Freestyle3D can be employed as a standalone device to scan areas of interest, or used in concert with FARO’s Focus X 130 / X 330 scanners. Point cloud data from all of these devices can be seamlessly integrated and shared with all of FARO’s software visualization tools including FARO SCENE, WebShare Cloud, and FARO CAD Zone packages. For more information about FARO’s 3-D scanning solutions, visit www.faro.com.